Led Zeppelin's eagerly-awaited reunion concert in London has been postponed for two weeks because guitarist Jimmy Page has fractured a finger. Originally scheduled for 26 November, the tribute concert in honour of late Atlantic Records founder Ahmet Ertegun will now take place on 10 December. 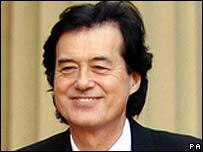 Page said he was "disappointed" by the postponement but that it would "enable my injury to properly heal". All tickets for the original show will be valid for the re-arranged date. Ticket holders who are unable to attend the rescheduled concert have until 1200 GMT on 14 November to apply for a full refund. 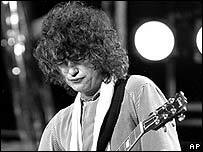 Page was injured last weekend and has been told he cannot play guitar for three weeks. In a statement put out by the band, a specialist is quoted as saying that, "with proper rest and treatment", he will be ready to resume rehearsing around 23 November. "Led Zeppelin have always set very high standards for ourselves," continued Page. He said the delay would permit the reformed group "to perform at the level that both the band and our fans have always been accustomed to". Page, singer Robert Plant and bassist John Paul Jones have not played together since 1988. Pete Townshend, Bill Wyman, Paolo Nutini and Foreigner will also perform at the one-off concert at London's O2 arena. More than a million fans applied for the 20,000 tickets available, which cost £125 each and were allocated by ballot. Profits from the show will go towards scholarships in Ertegun's name in UK, the USA and Turkey, the country of his birth. Page's accident will not prevent him from attending an awards ceremony in London on Monday, when he will be honoured as a living legend at the Classic Rock Roll of Honour. Did the long awaited comeback concert live up to the hype?